When Ada, the lovely founder of 001, very kindly invited me down to the beautiful Fortnum and Mason for a facial I could not have been more excited. I had first heard about the brand back in 2014 while watching the amazing Lisa Eldridge explain and demonstrate her facial massage routine (here) where she used the brilliant Eyecicle tool to massage her eye area. Ever since then I have wanted to learn more about the brand and last week I was lucky enough to have the opportunity to do exactly that and I can’t wait to tell you all about it because this is a brand you need to know about. 001 was founded by the absolutely fascinating and brilliant Ada Ooi (can you guess where the brand name comes from? ), a Hong Kong native and professional dancer, who after working in advertising for 10 years decided to follow her lifelong passion and delve in to the world of skincare and aromatherapy. She first trained as an aromatherapist but found that she also wanted to work on faces so became a certified facial therapist at the same time. The more she studied, the more she became interested in products, their ingredients and understanding the bio-chemical components and how they react with our skin. She wanted to truly believe in what she was using and really understand how and why they worked so she could use the right products on the right people. The creation of 001 came about from working in London and not being able to find a brand she felt could cater to all her clients so she set about making her own. The line is beautifully curated with only a few products but each one can be mixed to create a customized routine suitable for everyone. The products are loved by beauty insiders like Lisa Eldridge, Pati Dubroff and Sarah Jagger and have been featured in numerous magazines, despite only launching in early 2014. The products are truly exquisitely made, so it’s easy to see why they are already so popular. Now on to the facial. Easily, this was one of the very best I have ever had. After so many years in the business it goes without saying that Ada knows what she’s doing and her skills are perfectly complimented by her beautiful products resulting in a uniquely holistic experience. I have had plenty of facials in my time and mostly they were just ok, rarely were they very good and far too often they were downright awful but this was incredible. Not only did I love every minute of it but I could not believe how good my skin looked afterwards and continued to look with each passing day. 1. Cleanse: Exfoliating and Conditioning Cleanser – This product smells beautiful and there was a slight tingling sensation due to the lactic acid and low dose of BHA. It gently exfoliates without stripping and I loved how my skin felt afterwards. 2. Hydration: Rosa Damascena Essence Mist – Another beautifully scented product (something very important to Ada) that contains 98% high grade Damascena rose hydrosol collected from the 1st batch of essential oil distillation. Rose belongs to the mint family hence it’s extremely fortifying and antibacterial. 3. Exfoliate: Pure Active Peel – This is a mix of both physical and chemical exfoliation that uses the acids from Muscavado sugar and pineapple enzymes. The oil based formula allows the “oil attracts oil” reaction to happen as Ada massaged it into my skin, drawing out stubborn sebum in the pores to the surface. The fatty acids in the oils also ensure my skin is softened and not stripped dry. Chinese peppermint oil is used for its antibacterial properties. This is a beautiful exfoliating product that completely melts upon contact with water revealing baby soft skin texture and a bright complexion. 4. Ada’s signature Hybrid technique combining western lymphatic drainage with oriental meridian “scraping” (completely painless, leaving no marks on the skin so don’t be put off by the word) using a volcanic rock and their Intensive Elixir. Using the meridian scraping technique intensifies the drainage action to flush out toxins and treats water retention. This technique also manipulates the tissue and muscle around the facial anatomical structure for the ultimate lifting and sculpting effect. The “scraping” actions draw blood to the top layer of skin, encouraging the skin to behave how it should when active – the more blood, the more oxygen, which is so beneficial for skin that is suffering from poor circulation and sluggishness. I adored this step – Ada has a deft touch that is firm yet soothing and is able to really work the skin without causing any undue uncomfortableness. 5. 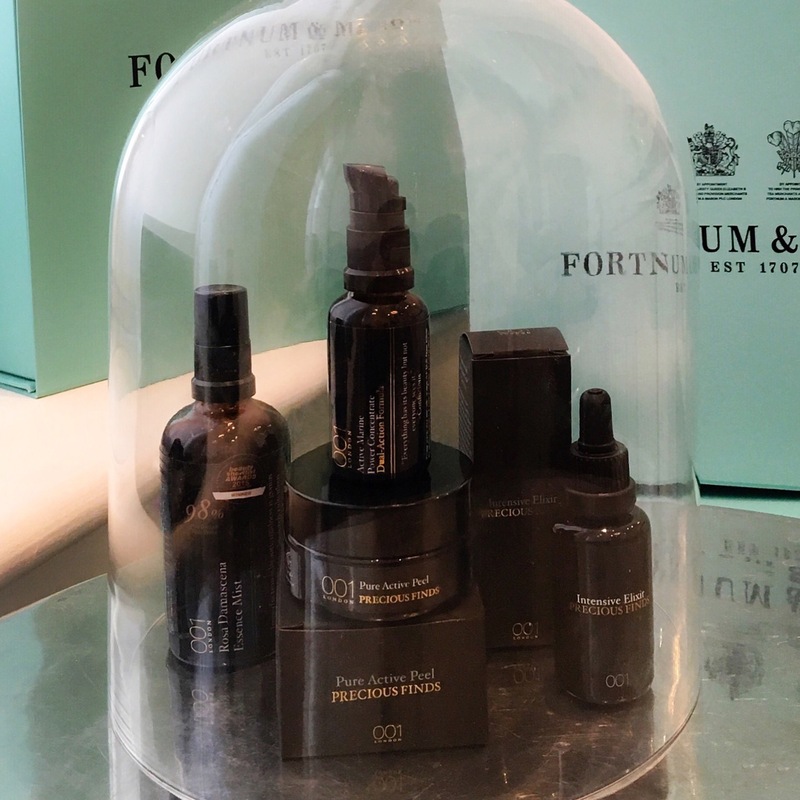 Eye massage with 001’s Eyecicle and Triple-Peptides Active Commander Eye Concentrate: This brilliant tool is my new favourite discovery and for good reason. It is a temperature conditioning device that stimulates blood circulation around the eyes, encourages toxin drainage and boosts oxygen to address puffiness, dark circles, wrinkles and skin sagging. It tightens, brightens and smoothes and I highly recommend this for anyone who struggles with their eye area. I have been loving this combo and will have a full review of both in the next few weeks. 6. Supreme Equilibrium Mask: A jelly like gel cream mask, containing high level of precious resin oils, manuka honey and shea butter. Ada also chose to create a “shield” with their Rose Mist and Silk Skin Sheet Mask to intensify the rejuvenating and deep moisturization. 7. Mild facial pinching and tapping techniques were used at the end to awaken the skin again and enhance product absorption. 8. The 001 system: To finish, Ada applied the Pure Lavender Hydrolat Toner, Active Marine Power Concentrate, then a mix of Intensive Elixir and GLA & Anti-oxidant Balancing Cream to further enhance the effect of the facial and protect my skin for the rest of the day. As I said earlier, despite loving every minute of the facial, what really impressed me was how good my skin looked afterwards. It was bright, clear, calm and balanced and continued to look that way for the whole weekend. I loved how smooth and soft my skin looked and felt so much so that I was already trying to calculate if I had enough time to book in for another one before I leave! A good facial is not that easy to come by so I just had to share my experience with you about this one because if you are in London or will be, you have to go. Ada is such a pleasure to talk to and so knowledgable about skincare and ingredients and I highly recommend you check out her products because they are exceptionally made and if you can, book yourself in for a facial – you will not regret it! The 001 Facial can be booked HERE and is £50 for 60mins (redeemable against 2 products) or £50 for 90mins (redeemable against 3 products). < Previous Best of British: An Introduction to Evolve Organic Beauty and Giveaway! I am sooooo intrigued by the meridian scraping. I tried imagining the technique. 😍 I bet your skin must be glowing. Your writing is detailed, as usual. This sounds like heaven! I’ve seen the little eye tool on your Instagram, great idea!